Figuring out the perfect cloth diaper wash routine can be the holy grail of cloth diapering. When I was starting out cloth diapering, it was really helpful to read how other people washed their cloth diapers. So here is our routine! Any poopy diapers are dealt with when they happen. Poop is plopped into the toilet and sprayed off (or dunked in our non-sprayer toilet). We store our dirty diapers in a large wetbag in a pail with a flip-top lid. Every 2-3 days we wash our diapers in our top-loader washing machine. Bac Out eats the bio-matter in the diapers, so it makes me feel more confident about an leftover poop residue in the washer. Second, we do a hot/cold wash with an extra rinse using Molly's Suds detergent (our favorite!). We also have liked Country Save and the Cotton Babies detergent in the past. We have hard water. Third, we do an extra double rinse on cold. It's important not to have any residue in the diapers. We've needed these in the past, although we may be considering cutting them out of the wash routine. Then everything goes in the dryer on high for 70 minutes (a full cycle) with a towel and wool dryer balls to help the diapers dry faster. What is your routine? Do you have any fool-proof tips or questions about washing cloth diapers? I'd love to hear it! 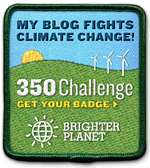 This is part of the Green Blogger Challenge! All images are from Pinterest.